The MILENA gasification process converts biomass into a combustible product gas with high efficiency. After cleaning, this gas can be used to generate power with gas engines, gas turbines or fuel cells. The gas produced by the MILENA gasifier is very suitable for application in a gas engine or gas turbine because of the higher calorific value of the gas (typical 16 MJ/mn3 dry, compared to 4 – 7 MJ/mn3 for a conventional air blown gasifier) and the complete conversion of the fuel (typical fuel conversion for downdraft or fluidized bed gasifiers is 85 - 95%). A detailed explanation of the working principles of the MILENA process can be found here. The MILENA producer gas is also suitable for conversion of (woody) biomass into sustainable Synthetic Natural Gas (SNG), also referred to as Bio-Methane or Biomethane. SNG has the same properties as conventional natural gas and can be used to replace natural gas in all applications. SNG is CO2 neutral, which means that no extra CO2 is added to the natural environment. The MILENA lab-scale installation was taken into operation in 2004. A pilot plant was constructed in 2008. The accumulated running hours in gasification mode of both MILENA plants is now over 5000 hours. A 4 MW Bio-Methane demonstration plant will be built in Alkmaar to demonstrate the integrated process of producing Bio-Methane from wood. Construction of the plant is scheduled for 2015. Several Bio-CHP demonstration plants using the MILENA gasification technology in combination with OLGA gas cleaning are under preparation at the moment. Gas engines and gas turbines are used to convert the gas in heat at electricity. The scale ranges from 1 MWe to approximately 7 MWe. ECN is the owner of the patented MILENA gasification technology and has licensed the MILENA technology to Royal Dahlman for certain regions. Dahlman is the engineering partner for the Bio-Methane demonstration plant and is also offering commercial size Bio-CHP plants using a combination of the MILENA gasification technology and OLGA tar removal technology. The MILENA lab-scale installation was taken into operation in 2004. A pilot plant was constructed in 2008. The accumulated gasification hours of the MILENA plants is now over 3000 hours. The Energy research Centre of the Netherlands developed CFB gasification technology for approximately 12 years. The experience gained with modifying and operating a 500 kW pilot plant was used to develop the Indirect MILENA gasifier. The gasifier contains separate sections for gasification and combustion. The gasification section consists of three parts: gasifier riser, settling chamber and downcomer. The combustion section consists of only one part. The arrows in the gasifier figure represent the circulating bed material. The processes in the gasification section will be explained below. Biomass (e.g. wood) is fed into the gasifier riser. A small amount of superheated steam is added from below. Steam can be replaced by air if nitrogen dilution of the producer gas is not a problem (e.g. if the gas is fired in a gas engine). Hot bed material (typically 925°C sand or olivine of 0.2 – 0.3 mm) enters the gasifier riser from the combustor through a hole in the gasifier riser (opposite of the biomass feeding point). The typical circulation rate on a mass basis is 40 times the amount of biomass fed to the gasifier riser. The bed material heats the biomass to 850°C in the gasification section. The heated biomass particles degasify and are partially converted into gas. The volume created by the gas from the biomass results in a vertical velocity increase over the length of the gasifier riser to approximately 6 m/s. It will ultimately create a “turbulent fluidization” regime in the gasifier riser and carrying over of the bed material together with the degasified biomass particles (char). The vertical velocity of the gas is reduced in the settling chamber, causing the larger solids (bed material and char) to separate from the gas and fall down into the downcomer. The producer gas leaves the reactor from the top and is sent to the cooling and gas cleaning section. The typical residence time of the gas is several seconds. The combustor operates as a bubbling fluidized bed (BFB). The downcomers transport bed material and char from the gasification section into the combustor. Tar and dust, separated from the producer gas, are also transported to the combustor. Char, tar and dust are burned with air to heat the bed material to approximately 925°C. Secondary air is added in the freeboard to reduce CO and CxHy emissions. Flue gas leaves the reactor to be cooled, de-dusted and emitted. The heated bed material leaves the bottom of the combustor through a hole into the gasifier riser. No additional heat input is required since all heat for the gasification process is produced by the combustion of the char, tar and dust in the combustor. The mechanical design of MILENA reactor is patented. The reactor vessel is a conventional carbon steel vessel with a refractory wall lining to reduce to heat loss and to keep the temperature of the carbon steel wall low. The main difference between the MILENA process and the FICFB (Güssing) process is the gasification in a riser reactor instead of Bubbling Fluidized Bed (BFB). The advantage of using a riser is that the area that needs to be fluidized is smaller; therefore the amount of fluidized gas (steam) is smaller. All the fluidization gas needs to be heated up to the gasification temperature; this has a negative effect on the Cold Gas Efficiency. 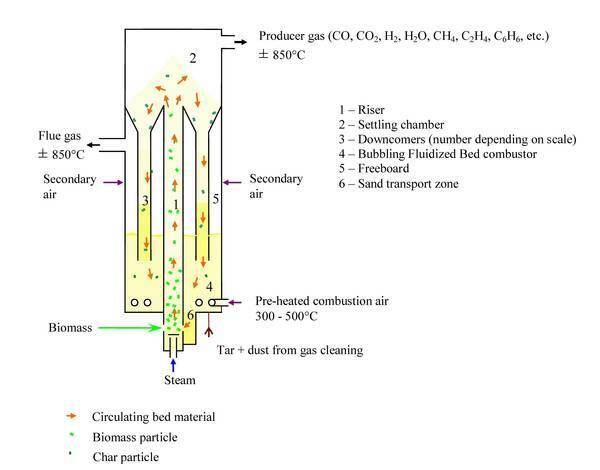 The process conditions in the steam blown bubbling fluidized bed gasifier however are optimum for primary tar reduction, because an excess of steam is available for tar reforming and the contact between (catalytic) bed materials is better than in a riser. Tests at ECN have shown that the tar dew point can be around 100°C when biomass is gasified in a steam blown BFB using (Austrian) using Olivine as a bed material. This agrees with reported results from the Güssing gasifier. The SilvaGas or Battelle gasifier is more similar to the MILENA process. Cold Gas efficiency and gas compositions are similar when both processes are operated under similar process conditions. One major difference is the use of a settling chamber in the MILENA process instead of a cyclone to separate the char and bed material from the producer gas. The settling chamber was selected to create a zone with a high gas residence time in an environment with a lot of dust (char / fine bed material), because these conditions are advantageous for tar reduction. The settling chamber makes an integrated design of gasifier riser, solids removal (the settling chamber) and combustor possible and more logical. By placing all the key components in one vessel, pressurized operation becomes easier. The SilvaGas uses two riser reactors, one for gasification of the biomass and one for combustion of the char. The MILENA process uses a Bubbling Fluidized Bed for the char combustion. The BFB was selected because the bed material / char ratio is higher in a BFB than in a riser; char particles are surrounded by more sand particles during the combustion process. The bed material acts a heat carrier, and cool the burning char particle as well as preventing local hot spots. Local hot spots are a cause for agglomeration (type II, melt-induced). The relatively high bed material / char ratio is expected to help preventing agglomeration problems.